Let’s assume that we have a range of data representing a population sample, we are going to make use of the Excel VAR.P function to determine the of variance the entire population. number2 is the second reference or number (optional). Variance is a measure of how far a set of data is spread out, providing us with a general idea of our data spread. 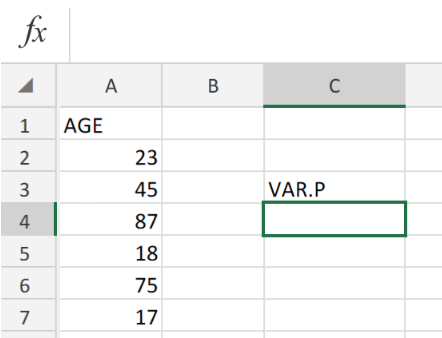 How to use the Excel VAR.P Function. We are now going to demonstrate the use of the Excel VAR.P Function in calculating the variance based on the entire population. List the sample data of the population in a column of our worksheet. Our purpose here is to determine the variance of a range of ages in a sample population. Be sure to leave a blank cell for Excel to return the variance value. Cell C4 of our worksheet example. The VAR.P formula which we will enter into cell C4 is;. The cell range A2:A7 represent the individual ages of our sample population. 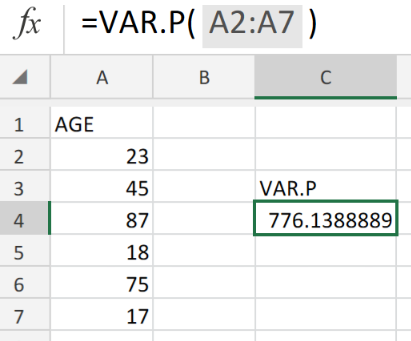 Even though our data set represents a sample of the population, the Excel VAR.P Function will assume that it represents the entire population.